Unlike the $8.7 billion incentives program Washington state offered Boeing in 2013, the deals Amazon struck are contingent on its adding jobs in its new locations. Virginia’s offer of $573 million in direct public incentives and New York’s package, in excess of $1.5 billion, weren’t the richest of the many deals pitched to Amazon for the prospect of 25,000 new, high-paid tech jobs in each place. The winning packages, disclosed by Amazon on Tuesday, also paled next to Washington state’s historic $8.7 billion giveaway to Boeing five years ago. But the still-enormous enticements offered — by both the winners and the losers of the yearlong HQ2 sweepstakes alike — dramatically illustrate how Amazon played the game of “smokestack chasing” like no other corporation in history. They also added fuel to the ongoing debate over whether such incentives are good policy — or even whether they work, a premise questioned by academics who study economic development. For its part, Amazon downplayed their importance in its final decision. New York state Sen. Michael Gianaris and New York City Council Member Jimmy Van Bramer expressed “serious reservations” about Amazon’s arrival in Long Island City, which they represent. In a joint statement last weekend, the lawmakers called out in particular the expected size of the incentive package. 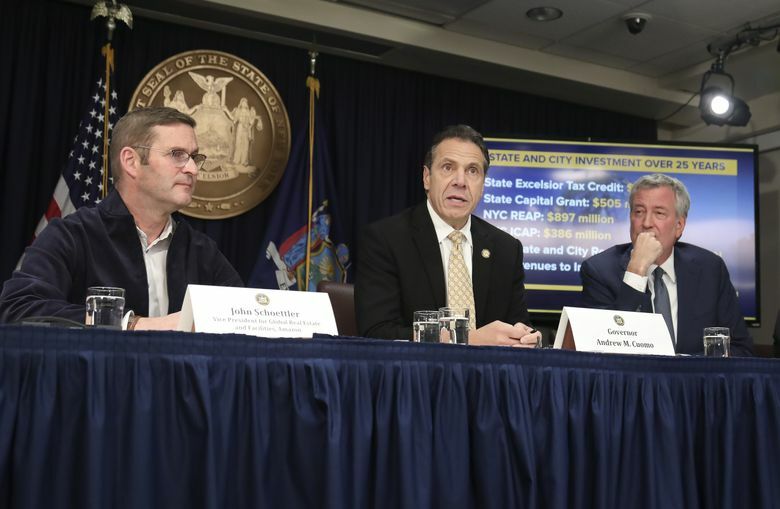 “Offering massive corporate welfare from scarce public resources to one of the wealthiest corporations in the world at a time of great need in our state is just wrong,” said Van Bramer and Gianaris. In some respects, Amazon’s decision seemed to have little to do with the size of the incentive packages offered. That said, the winning bids represent a substantial evolution in the kind of packages governments have routinely offered to attract — or keep — companies. Even taken together, the incentives Amazon described Tuesday, including tax breaks, cash grants and infrastructure investments (see below), are well shy of the whopping $8.7 billion that Washington state lawmakers offered Boeing in 2013 in a controversial effort to keep jobs and production in the state. While Boeing did site its 777X production in the state, the aircraft maker’s total employment here actually fell after the deal, from 81,939 in late 2013 to 65,829 at the beginning of this year, even as the company has continued to benefit from what still stands as the largest state corporate tax break in U.S. history. That won’t be the case with Amazon at its new East Coast bases, thanks to their “performance-based” structure. There’s another comparison to Boeing, which relocated its corporate headquarters from Seattle to Chicago 17 years ago. The motivation for Amazon’s two additional headquarters, along with their scope, differs substantially from Boeing’s. But it still raises the specter of that loss and the psychological blow that came with it, as well as the soul-searching and recriminations over what was lost. “The ghost of Boeing is certainly hanging over all of this for Seattle,” said Margaret O’Mara, a University of Washington history professor who studies the growth of the high-tech economy and the influence of U.S. politics. In releasing details of the bids so quickly and in detail, Amazon sought to deflect some of the criticism over its aggressive — and heretofore largely secretive — efforts to wring subsidies and inducements from the more than 200 North American communities that bid for HQ2. Throughout the process, Amazon maintained that access to talent was, in Carney’s words, “the driving factor for us.” Indeed, high-tech companies in particular are largely drawn by access to skilled labor — and by amenities that make a location attractive to workers. Research shows “incentives are a minor factor in most firms’ location decisions and that the majority of companies receiving incentives were probably coming anyway,” said Nathan Jensen, a business professor at University of Texas at Austin who studies economic development incentives. That’s underscored by the fact that Amazon, after a nationwide search, landed on two of the most obvious destinations from a talent perspective in the first place: the Long Island City community of Queens and the Crystal City area of Arlington County, Virginia. Despite such research, states and local governments are reluctant to give up the incentives arms race. Cities and states have long vied to attract new businesses with tax incentives, industrial parks and other giveaways. Amazon’s HQ2 process is a continuation of “the long and familiar game of what used to be called smokestack chasing,” O’Mara said in an interview before the company’s expansion locations were announced. “We can fault Amazon for trying to play all these cities against each other … but they’re playing a game that’s been played for 75 years,” she said. But there’s no precedent for the scale of Amazon’s game — both in terms of the number of cities and states that played and the proffered prize: a new, coequal headquarters of one of the defining companies of the 21st century. “The dollar numbers were shocking. But it is also amazing that governments were willing to forgo decades of taxes, not only from the company, but from the employees,” Jensen said. “A politician can put in a HQ2 bid to show that they tried, even if it wasn’t serious or credible bid,” he said. $1.525 billion, including a credit of up to $1.2 billion from the taxes Amazon expects to pay on the salaries of its 25,000 Long Island employees over the next decade, and a $325 million cash grant based on the square footage of the buildings on Amazon’s new Queens campus. The company also intends to apply for other incentive programs from New York City that weren’t quantified.